Bollywood is the place where the artists connect the fans with their art. Bollywood songs allure the fans for sure. However, time after time we see Bollywood songs which were copied from other songs. Thanks to the internet for giving us the access to international music with just a click. Today we have brought you some of the superhit Bollywood songs which were shamelessly copied from the Qawwali’s of Nusrat Fateh Ali Khan who was a Pakistani musician and he predominantly used to sing Qawwali. 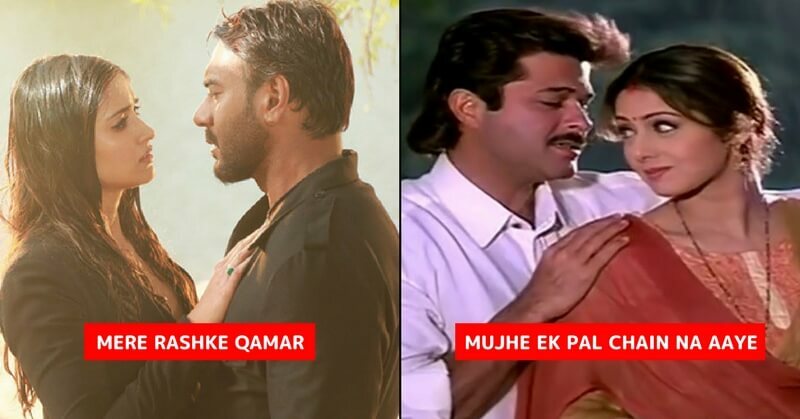 Composed by Nadeem-Sharavan, the Judaai song Mujhe Ek Pal Chain Na Aaye is actually the copied version of Nusrat Fateh Ali Khan’s Sanu Ek Pal Chain Na Nave. Hats off to Bollywood, as they have copied 90% of the music as well as the lyrics of the original song. One of the chartbuster song of 2017 and remade so many times last year featuring Hrithik Roshan and Sonam Kapoor. The superhit Qawwali of Nusrat has been revitalized multiple times. Recently, the song it was adopted in the soundtrack of Ajay Devgn starrer Baadshaho movie. The song, Mera Piya Ghar Aaya featured Madhuri Dixit dancing on stage. The song was composed by Anu Malik. Well, people had less idea about the song being a copied one. The original one was sung by Nusrat Fateh Ali Khan. Besides the music, the lyrics are also similar. We all remember the song, Kitna Pyara Tujhe Rab Ne Banaya from the movie Raja Hindustani. Composed by Nadeem-Shravan, the song was actually copied from Nusrat’s song titled as “Kinna Sona Tenu Rab Ne Banaya”. It is another Nadeem-Shravan’s song which was actually copied from Nusrat’s collection. Nusrat sang the original one Kissey da yaar na vichdey.